Choosing a vegan (or vegetarian) diet has a positive impact on our health and environment. Summertime provides a fresh opportunity for us to enjoy our garden gifts in a myriad of meatless ways. Try this vegan recipe below. Mix any vegetable with a proper al aglio e olio sauce (best quality extra-virgin olive oil slowly infused with plenty of fresh garlic) and you have perfection on a plate. It’s a breeze to prepare—a real plus during August’s steamy dog days when no one wants to spend excessive time in the kitchen. Al aglio e olio dishes are especially fun for cooks who like to improvise. You can use virtually any vegetable you like here, mixing and matching depending on what’s in season—this month, tomatoes. Here, the subtle sweetness of the spinach and acidic sweetness of the roasted tomatoes play nicely against the assertive and briny Kalamata olives. * Nutritional yeast has a cheesy aroma and a creamy texture when mixed with water. It’s rich in protein, B vitamins, phosphorus and other minerals. You can find it at most health food stores. Heat oven to 400 degrees. 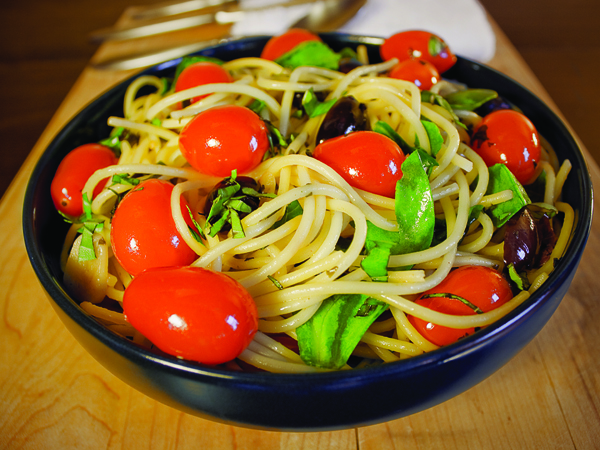 Toss cherry tomatoes with two tablespoons of oil and the basil. Roast, covered with aluminum foil, for 20-25 minutes, or until the tomatoes have wilted. Heat the remaining oil in a large pan over medium-low. Add the garlic and saute until soft. Be careful not to burn the garlic. Add olives, parsley and roasted tomatoes, along with any pan drippings. Cook for about 10 more minutes. Just before serving, add the spinach and toss gently. (The heat will wilt it.) Toss with the pasta, and adjust the seasonings. Drizzle with extra oil and sprinkle with nutritional yeast, if desired.